It's a dangerous world out there in cyberspace. Security threats are escalating every year and have become more malicious with cybercriminals entering the scene stealing financial and personal information. Cell phones and automobiles are becoming more computerized, and hackers have an even wider selection of devices to infect with malicious threats. With so many pluggable devices available coming on the market, new areas of exposure are created. Malware. Exploits and malware are increasing through vectors ranging from social networks to mobile devices to employees themselves. As computer and operating system security continues to improve so will cybercriminals' new techniques to bypass these defenses. Mobile Threats. Attackers are turning their attention to launching mobile banking attacks. Consumers will begin to see banking attacks migrate from the computer to the smartphone. Keep in mind that if your smartphone becomes infected, it can infect your computer and your home or work network. Threats to Mobile Payments. Electronic currency has made sending money extremely easy. Buying or selling, paying for entertainment, and sending money to a friend from a mobile device is becoming more popular. Electronic payments, however, are often not encrypted, unless you're using the mobile safeguards provided by your bank. Hackers know this and are increasingly targeting the growing use of cyber currency as a means to steal money and spread malware. Attacks on SMBs. 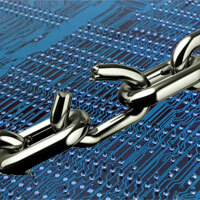 Small businesses believe they are immune to cyber-attacks. They erroneously think they have nothing an attacker would want to steal. They forget that they retain customer information, create intellectual property, and keep money in the bank. Truth is, small companies are typically less equipped to defend against an attack. From an attacker's point of view, any business is a potential target, no matter its size. Uneducated Users. The average user has become educated enough not to click on an attachment in unsolicited e-mail, but do they know how to defend themselves in today's constantly-changing threat environment? The first step in computer security is being aware of the risk environment. Information security awareness training helps computer users develop the skills to identify risks and scams and avoid becoming a victim. User Errors. Computers are great. And in fact, they are better and more reliable than people for many transactions. Computers, for example, are better than doctors at diagnosing some illnesses. That said, humans make mistakes when using computers, especially when they’re not savvy about computer security. Even if you think you're doing all you can to avoid common security threats, you'd probably be surprised at how easily an outsider can find common -- even silly -- mistakes.